NIPSCO is reporting 40,000 of its electric customers have been affected by Monday’s blizzard. The storm’s 45 mph winds brought heavy snowfalls, downed power lines and split poles. A utility spokesperson said employees continue to work around the clock to restore power, with additional resources supporting the call and emergency command centers. Outside crews have also been secured for added support. As of 5:00 p.m. CT Monday, power had been restored to 80% of those affected. Approximately 6,800 customers remained without power – primarily located in Lake, Porter, and LaPorte counties. NIPSCO estimates a majority of the remaining affected customers will be restored by midnight Tuesday. They include areas in Cedar Lake, Chesterton, Crown Point, Dyer, Gary, Griffith, Hammond, Hebron, Highland, Hobart, Lake Station, LaPorte, Lowell, Merrillville, Michigan City, Munster, Pleasant Lake, St. John, Schererville, Valparaiso, and Wheeler. The loss of electric power along with the cold weather brings added risks for residents in those areas. NIPSCO issued a list of safety reminders. 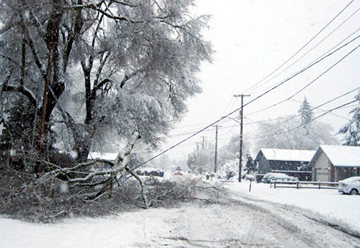 • Avoid downed power lines, damaged poles or other hazardous situations. Every downed wire should be treated as though it is a live wire. NIPSCO said its restoration process begins with repairing large transmission and distribution lines that supply electricity to large numbers of customers in large geographic areas – including critical customers such as hospitals and emergency response. Repairs to other lines that serve smaller groups of customers can’t be made until the larger lines feeding electricity to those areas are repaired. To report a wire down or pole damage, call 1-800-4-NIPSCO or 1-800-464-7726.